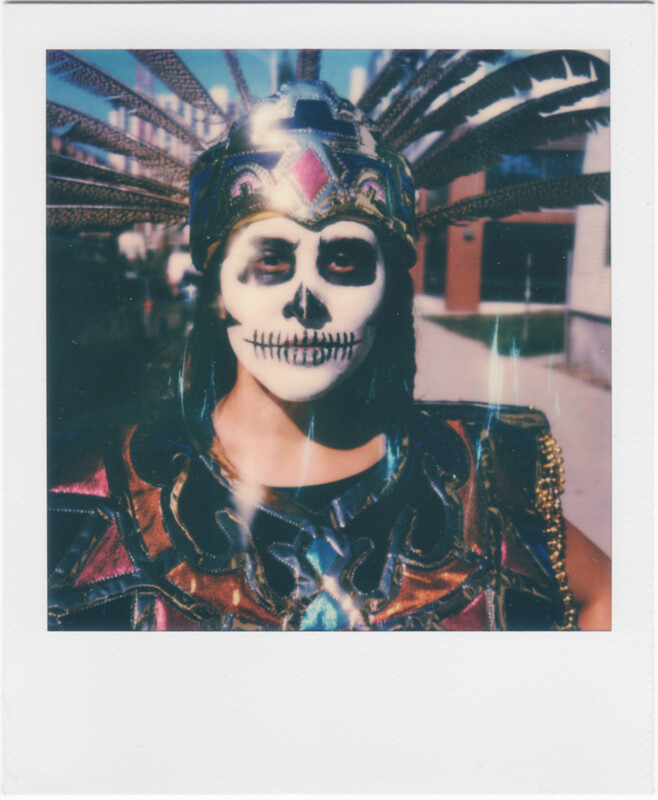 I experimented a lot, at this year’s Dia de los Muertos parade. In addition to the point and shoot loaded with black and white film, and my digital cameras, I also brought a Polaroid SX-70 — the one that I have on loan from my friend Jerry. With a fresh pack of film with only eight exposures, I was very selective. Shooting with the SX-70 is good for a few reasons. At $2.50 per picture, it’s quite expensive, so I’m really careful about what I shoot. I’m an extremely prolific digital shooter and this forces me to really slow down and become picky. The vintage and revolutionary camera is also really neat to use. Finally, with an actual 116mm focal length but with a 45mm or so equivalent focal length (in 35mm terms), this camera works really well for closeup portraits. The last point may need some clarification. The SX-70 is really a medium format camera and the film area is much larger than “full frame”. So while you get the flattering compression sought after in portraits, the 45mm or so angle of view allows me to get really close. The muted low-fi look is part of the charm. And the size of the photos are just about right with a wonderful square format. The other instant film, the Fuji Instax, is a bit small. I don’t know if I treasure these prints because they are so expensive or because they have a unique look and feel. Perhaps a little of both. Having something that can be picked up and rearranged on the desk gives them a physicality that digital lacks. I enjoy shooting Polaroids more than I expected. Does reminds me of old days. Getting Polaroid pictures taken and keeping them as mementos. This one has also the same quality. A bit retro. Yes, agreed. I never had a Polaroid but always loved the look of the SX-70. Such a revolutionary camera.